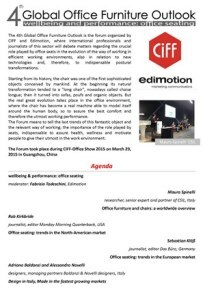 The 4th Global Office Furniture Outlook is the forum organized by CIFF and Edimotion, where international professionals and journalists of this sector will debate matters regarding the crucial role played by office seats in the evolution of the way of working in efficient working environments, also in relation to new technologies and, therefore, to indispensable postural transformations. Starting from its history, the chair was one of the first sophisticated objects conceived by mankind. At the beginning its natural transformation tended to a "long chair", nowadays called chaise longue; then it turned into sofas, poufs and organic objects. But the real great evolution takes place in the office environment, where the chair has become a real machine able to model itself around the human body, so to assure the best comfort and therefore the utmost working performance. The Forum means to tell the last trends of this fantastic object and the relevant way of working; the importance of the role played by seats, indispensable to assure health, wellness and motivate people to give their utmost in the work environment.